On Jan 16, my son I watched the first launch of a Delta-IV Heavy from Vandenberg. I blogged about it. Here is the video I shot of the launch. We are off base at a public-viewing area. My video is hand-held…sorry for the shakes. For those that want to instill a love of space and rockets in a new generation of pioneers, there is nothing better than letting them experience space – launches are a great way to do that. OPTION 3: keep the asteroid in orbit, mine the asteroid there and sell its contents for space purposes, like metal trusses for space stations & spacecraft, solar panel components, mass for shielding, etc. This way you avoid ever having to reenter all of that asteroidal material. But that is silly, the critic says, there is no market for the on-orbit products this solution hopes to produce. You have made the solution so complex, it will be prohibitively hard to raise the investment money for such an endeavor, plus the complexity will delay liquidity events to allow for a time-consuming development cycle (space manufacturing center, etc.). 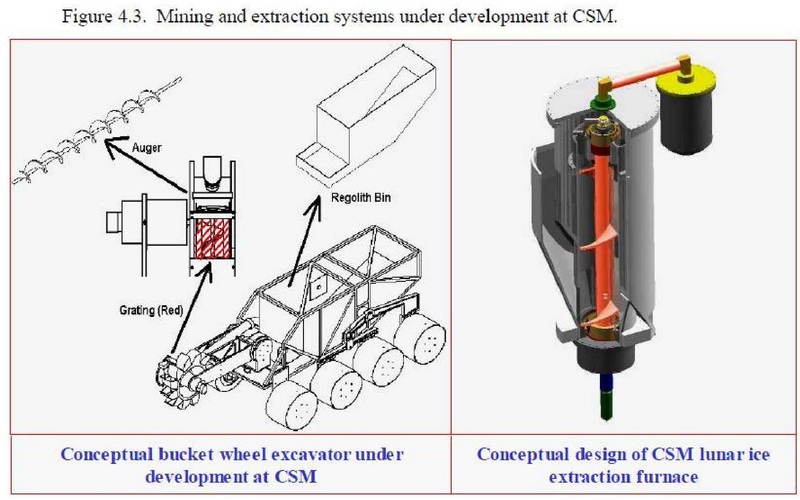 Why not develop a compact mining device that can be sent to surface of an asteroid, dig through a bunch of asteroidal material, find REMs, and just return that few hundred/thousand kilograms of valuable material to earth? And now we are back to Option 1. Did I mention asteroid mining is hard (and the life of a critic is substantially easier). Well, I wanted to talk to an entrepreneur who was working on closing this challenging business case of Asteroid Mining. Which of the three options would he pick (or would he pick a fourth option unmentioned)? Michael Heartsong is cofounder of Promethean Enterprises, Inc. Michael is a finance and management consultant by day. This serial entrepreneur has been involved in six startups, two of which, have now been in operation for over twenty years. Last year, Michael was on the Space Show to talk about his new space mining company, Promethean Enterprises, Inc.
Promethean’s angle for closing the asteroid mining business case is the realization that large US aerospace companies are willing to mine asteroids today...but only if their risk was somehow mitigated. Through contracting instead of partnership, Promethean intends to leverage the skillsets of the nations brightest engineers without having to pilfer them from Boeing. With the right plan, the engineering skills can be bought. It’s an intriguing strategy (if perhaps unproven), a space firm whose competitive advantage is NOT engineering. You will hear in his answers below, Promethean is leaning towards Option 3 (see above for "Option 3" definition). Q: For those not familiar with your asteroid mining white paper, can you give us a brief overview of your Asteroid Mining business concept? Michael Heartsong: We intend to build and send robotic mining devices to asteroids; process the ore in space and turn it into propellant (water broken down into hydrogen and oxygen) and structural material. The structural material could be used to repair the International Space Station (or build a new one; or build other structures in space). And we intend to use the structural material to build a vast, many square kilometer solar-energy gathering array; turn the electricity generated thereby into microwaves; beam the microwaves down to earth, where they will be captured by a receiving antenna ("rectenna"), reconverted into electricity, and fed into the grid. In this way, we hope to be a major part of solving Earth's looming energy crisis (the Earth uses about 14 terawatts of electricity each year. It is predicted that by 2050, we will need 40 terawatts. 75% or more of all electricity today is generated by burning fossil fuels. It is simply impossible to generate 40 terawatts (or even 25) with current technology: the stores of fossil fuels will be depleted. More importantly, we would destroy ourselves with the resulting pollution. (Remember the film, CHILDREN OF MEN in which almost all adults had become infertile). That is the Big Picture. AT the moment, it is just an idea, a vision. The next step is to turn the vision into an executable plan. Q: That is a BIG effort – how are you proceeding? Michael Heartsong: Our plans call for proceeding in essentially two Phases. Phase One is a Research Phase, that will last at least 1 1/2 years, probably 2. During this Phase, every aspect of the vision will be researched, contemplated, examined. We intend to prove and validate that what we are proposing can be accomplished with exiting technology (as as technology advances, what we are proposing becomes ever more achievable. We will identify providers--companies and people who can participate in the venture. This Phase will drill down to specifics: how best to move forward, at what cost; who can undertake it; how long will it take to design, build and launch one or more robots; which asteroids are the most promising and why, etc. etc . One of the products from this Phase will be a document that will demonstrate conclusively that what we are proposing is an economically viable business venture. We would then leverage this analysis to raise the hundreds of millions (possibly billions of $$) that will be required to succeed in the venture. And execute the venture. Q: So Phase I is “Build a Plan” and Phase II is “Execute the Plan”. How much capital do you need for this first exploratory Phase I? Michael Heartsong: We are seeking $12.5 million of seed capital with which to finance Phase One. Q: What industry partners are you working with on this venture? Michael Heartsong: We have already had conversations with several people at Boeing, who are excited by our plans. We have a written invitation from Boeing to submit to them an RFP, so they can tell us how much of Phase One they would like to participate in, and at what cost. We have also had conversations with L'Garde, the premier deployer of inflatable space structures. Additional partners would be added throughout the phase as needed. Q: Will you be incorporating a NEO surveying mission (NEAP 2.0) prior to your mining efforts? Michael Heartsong: There is actually a great deal of information already collected about Near Earth Objects (NEO), and more being collected every day. One aspect of Phase One will be to identify the criteria on the basis of which an asteroid would be selected as a target for our mission. Phase One will also include actual spectrographic analyses of potential asteroids. We hope by the end of Phase One we will know precisely which asteroids are the best potential targets. Q: To accomplish your plans, how much of your plans utilize existing technologies and how much requires you develop new technologies? Michael Heartsong: What we are proposing can be accomplished with existing technology. That said, it will still require a great deal of ingenuity, imagination, and intelligence. What we are proposing is simpler than other complex projects. We have already sent vehicles to comets and asteroids, and even landed on asteroids twice. And we are NOT talking about sending a human being to an asteroid, just a faith robot. Although what we are proposing has never been done, all of the various components are achievable with existing technology. We just have to figure out how best. We think once we are at the end of Phase One, having proven the economic viability of what we are proposing, people will be eager to invest. The challenge is raising that first $12.5 million in order to complete Phase One. Normally, when one is raising seed capital, investors are naturally concerned about the safety of their capital, and the likelihood of seeing a return. The major risk, normally, is loss of capital. We think our situation is very different – the risk is in not investing. Q: Recent topics on this blog have included discussions about the late Jim Benson’s plan to own an asteroid. What are your thoughts on such an acquisition? Q: If my readers want to reach you, would you leave an email address? Michael Heartsong: Thank you again for this opportunity. I welcome any and all comments from your readers, who are welcome to contact me at michaelheartsong8 [at] gmail.com. Colin Doughan: Thank you, Michael. 2011 is the year of raising $12.5M. When you are successful, I would like to do a follow-up interview. I feel this was a “strategy” interview. I can’t wait for the “tactics” interview where I can ask all of the questions that are “plan specific”. Thank you for your willingness to share your vision so early in your entrepreneurial process. I hope your openness is rewarded. And I wish you nothing but the best. Last Thursday, NASA’s Johnson Space Center published the presentation, Human Spaceflight Affordability: Advanced In-house Development, a series of projects…space problems, that they would like to go solve (or work toward solving) using “primarily civil servants” but willing to “engage non-traditional partnerships” when needed. On the one hand, JSC is looking to keep its workforce busy on value-add projects, so it is not surprising they are seeking to accomplish these projects primarily in-house. But more importantly for an entrepreneur, JSC has just published eleven problems they believe are worth spending money to go solve. Can you close a business case around all of them…no. Will JSC solve them all...no. But some of these ideas could be developed and offered commercially. Here is my summary of the eleven ideas, but do read JSC's full presentation. For some of the ideas JSC goes into significant detail of their development plans or their proposed final solution. Dual purpose EVA suits: for space and surface work. Focused on grit tolerant joints. Suit-Port: Half a space suit, rear-entry, easy access, eliminates pre-breathing, low risk of contaminating habitable environment. Low-Mass/Low-Volume Exercise equipment. Perhaps wearable robotics to simulate the gravity’s effects on muscles (the opposite of what such exoskeleton projects are used for on earth). Free-Flying Cameras: Remote controlled cameras for inside and outside space stations. Deployable through the JEM airlock. Down Mass from ISS: capsule to return low-mass, high-value payloads down to earth from the ISS. Deployable through the JEM airlock. Advanced Environment Control and Life Support System (ECLSS) – develop now for when humans need to travel a long way from home. Significant work could be done advancing this idea without the need for rocket launch. Use ISS Waste to make propellant (maybe to fuel Free-Flying Cameras listed in number 5). Eleven ideas. Thanks JSC. Entrepreneurs, sharpen those calculators. My son and I went out to Vandenberg with a picnic lunch to watch a rocket launch and ooooh, boy, what a rocket launch. The temp was a balmy 72 degrees. The breeze was calm. The sky was blue with a few wispy clouds. No fog, which is always a potential at Vandenberg. The launch, the largest ever out of Vandenberg, blasted off the coast of California a little after 1pm PST. As with previously launches out of Vandenberg, my son and I saw the Delta IV Heavy before we heard its powerful engines. We both felt the launch as well as heard it – felt it in our chests as the rocket fought to alter our heart beat to its own internal rhythms. But I was expecting the noise to be commensurate with the payload size…it was not. Loud, but not overwhelmingly so. Three flames pushing to the sky. Best picnic launch my son I have had this week! With the costs of rare earth metals on the rise, why can’t space entrepreneurs mine asteroids for platinum and other REM’s and return the materials to earth? Shouldn’t finding so many near earth asteroids make the problem even easier to solve (less delta-v to reach these nearby asteroids)? Usually this blog focuses on the positive – on the how you could make this happen. Today we are going to look at how hard it actually would be to close such a business case. Mission: Mine platinum on NEOs and return the processed ore to earth for sale and consumption. Sale of platinum sole revenue source for the mission. Based on these assumptions, the sale of the platinum mined on the asteroid would cover 7% of the mission costs. This business plan stinks. Not 7%, that seems too small. Really? Only 7% of mission costs could be covered with the assumptions above? Well how elastic are these assumptions? How far would we have to modify the assumptions to get more satisfying results? What if platinum was found in higher concentrations? What if the mining device could mine more? What if the price of platinum were higher? What if mission costs were reduced? What if platinum was found in higher concentrations. The table below shows platinum concentrations would have to exceed 4% to cover mission costs. What if the mining device could mine more. The table below shows the mining device would need to mine over 1300x its own mass to cover mission costs. What if the price of platinum were higher. The table below shows the price of platinum would need to balloon to $800,000 per kg to cover mission costs. What if mission costs were reduced. The table below shows mission costs would need to be reduced to $44M. But I can’t leave a post with such reserved pessimism. The table below shows that if an entrepreneur could find a NEO with platinum concentrations significantly higher than average even while assuming a less efficient mining device, such a mission may be possible if the costs could be reduced to less than $150M. Have fun (in a nerdy spreadsheet kind of way) building your own platinum mission by using the spreadsheet located here. This is Part 2 of a two-part interview with Brad Blair, ISRU and lunar mining researcher. We are discussing Blair’s 2002 paper entitled “Space Resource Economic Analysis Toolkit: The Case for Commercial Lunar Ice Mining.” Get your copy here. In Part 1 of this interview, Brad discussed two architectures his team considered for lunar mining. In Part 2 we discuss lunar ice, nuclear vs. solar, Blair’s economic model used in paper, changes since 2002, how SpaceX has affected the business case for lunar mining and more. The images used in this blog post are from the Paper referenced above and used with permission from Brad Blair. Q. Your baseline business case assumes 1% ice in the lunar regolith (page 34). How has recent scientific discoveries about the moon affected this assumption? Brad Blair: The business case closed at 2% ice (note that this was one of four primary feasible conditions that caused the case to close). We ran sensitivity analysis and there is a knee in the curve starting at 0.5% and ending around 4% - see Figure 4.8 in the report. The explanation for this is that more mining and hauling equipment is needed for lower concentrations of ore, necessitating higher capital investment in the mining plant mass in order to meet productivity requirements. Above a certain concentration however other constraints tend to dominate, reducing the beneficial influence of higher ore grade or percent ice. 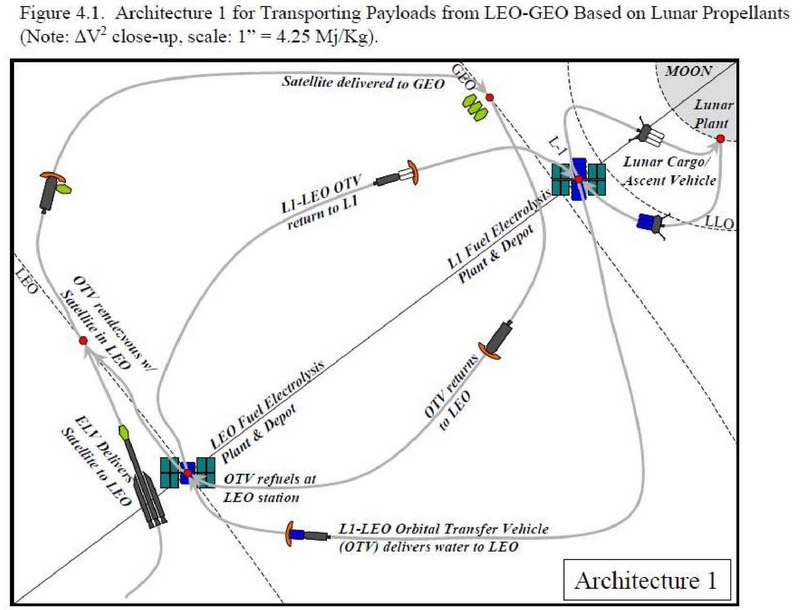 The primary constraint above 4% ice for example is the power system mass needed to run the electrolysis system (which is needed to convert the water into hydrogen and oxygen for enough propellant to boost the payload off the lunar surface and toward the first propellant depot). Recent scientific discoveries are of course very helpful to the business case. Turns out the ice is likely much greater than 4%, and may even approach 100% in localized high-grade zones. That does simplify the production model a bit, and will clearly have a positive effect when it is time for the engineers to design the details of the lunar surface facilities. One other aspect is the recent discovery of evidence that nitrogen and carbon ices may also exist. For human habitation Nitrogen becomes an important element due to its buffering effect for the air we breathe. It simplifies a lot of life support issues because it is well understood here at home. For long term habitation, a pure oxygen environment is problematic and other buffering gases can cause problems. Carbon opens up a lot of possible secondary products such as liquid storable hydrocarbon fuels like kerosene. It also could be used for manufacturing plastics or other organic chemicals needed for industrial uses. However we desperately need to verify the remote sensing geophysics with ground truth. Geophysicists will admit to you that there is a given amount of uncertainty in their conclusions due to measurement taken from orbit. While we know a lot about specific equatorial lunar conditions due to the Apollo missions, the "ground truth" available to calibrate spacecraft sensors at those locations is not applicable to polar sites due to extreme environmental differences. A RTG-powered surface rover mission in a lunar polar crater is a critical next step in proving technical and economic feasibility. Note that the first surface rover could provide sufficient ground truth to begin the harvesting of much more detailed understandings from the existing polar spacecraft data sets. LCROSS is a prime example of this. Q. To power your lunar mining facility you baselined nuclear power but were considering a new generation of solar power as well. What is your current preferred lunar power source and why? Brad Blair: Nuclear power is the key to steady-state mining and mineral processing operations. The reason for this is that other that wear & abrasion, most of the problems with mining equipment happen when the equipment is turned off and then back on. For equipment operating in locations that are only 25 Kelvin this will likely be exacerbated, especially since engineers currently like to design spacecraft components to operate at laboratory temperatures. Electronic systems are particularly hard hit when they are cooled to that level and then re-heated (thermal stresses in a complex array of materials tend to cause components to pop out of circuit boards for example). The simplest solution is to keep things warm of course. That requires a steady source of power. For rover missions that means using an RTG. The Mars Science Lander mission will be able to operate day and night because it has an excellent power source. In order to make solar power work at the same level of robustness and availability, batteries are required that are sized to survive the night. Even the best locations on the Moon have significant periods of shadow, thus the mass of the batteries quickly becomes the dominant constraint. Add to that the requirement to somehow get the power into permanent shadow and technical risk goes exponential due to systems complexity. In order to make solar power work for a mining plant inside a permanently shadowed crater it will require extending the current technology envelope with a number of serial breakthroughs. 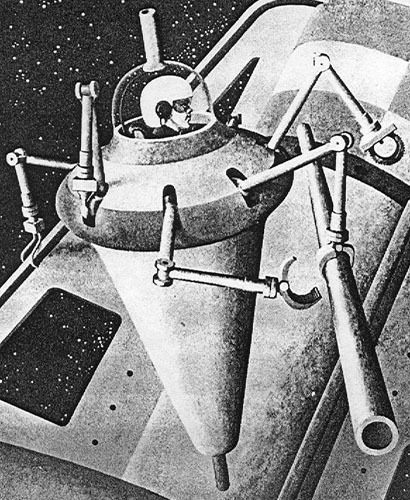 Nuclear power plants for space have a long heritage (especially considering the Russian experience) and actually work better in cold conditions. Having said all of that, solar power does have an upside potential due to the potential for geometric growth under the conditions of in-situ production. Alex Ignatiev of the University of Houston has figured out a way to make low-grade solar cells using 99.9% lunar materials. I would consider nuclear power the best baseload supply option and use in-situ solar for peak power while the sun is shining. Q. Describe the excel tool used in much of your analysis. Is this a tool you developed? If starting over would you use Excel again or would you recommend an alternate tool? What were the pros and cons of using this Excel? Brad Blair: The benefits of developing a spreadsheet-based modeling tool is that it is simple, transparent and the software to run it is accessible to most people. Given the overall simplicity of the math, spreadsheets are the most common tool used for financial analysis. Plug-ins can be purchased for decision analysis, Monte-Carlo simulation, econometric statistical analysis or other higher mathematical functions. It is also relatively straightforward to set up linear or integer programming optimization models using the tools within a typical spreadsheet. The cost modeling was done using NAFCOM under a license granted through the NASA contract. From the perspective of the parametric engineering model, interconnected spreadsheets offer a simple and transparent way to model linear or geometric behavior for estimating mass and power requirements based on unit mass and power assumptions made by selecting appropriate analogies. Detailed design would of course take advantage of the great strides made in the last 20 years in modeling and simulation of the physical, chemical, thermal and electrical behavior of materials and integrated systems. Many tools are available for this today including a growing library of open-source code. I spent some time in the real-time simulation world and the tools there are amazing, considering the fact that they can leverage dedicated parallel real-time graphics or physics processing units (GPUs or PPUs) paid for by the gaming industry. Q. Have any entrepreneurs shown interest in turning your analysis into a lunar venture? Brad Blair: Yes. However I have signed a confidentiality agreement, and am not at liberty to disclose the details. Q. What has changed since this 2002 analysis to make your lunar mining business case more attractive to investors? Brad Blair: There are much higher lunar resource grades than previously expected, a wider variety of ores and a greater confidence in the geologic models due to recent lunar missions than at any time in the past. In addition, the steady migration of silicon valley capital and entrepreneurs into the space world provides a much broader base for the emergence of new space markets – the key to a sustainable set of interlocked enterprises that will steadily develop the space frontier for human settlement and commerce. Finally, steady progress in new technologies has been made by NASA, the aerospace industry and international partners, demonstrably lowering costs as evidenced by SpaceX among many others. Indeed, I sense a tipping point may be drawing close. Q. What has changed since this 2002 analysis to make your lunar mining business case less attractive to investors? Brad Blair: Lower product price, thus lower revenue as you pointed out in question above about SpaceX’s reduced launch price. Also, the manifold risk elements are becoming more transparent. This second item is good in my opinion because I prefer rationality to ebullience and don’t really like surprises. Q. For the return trip from GEO to LEO you assume you will be aerobraking. You use 500m/s for this return trip with the aerobraking assumption. But to leave GEO and return to LEO you would first have to do the circularizing burn in reverse (1300-1700m/s) and then you could aerobrake into Earth's atmosphere. 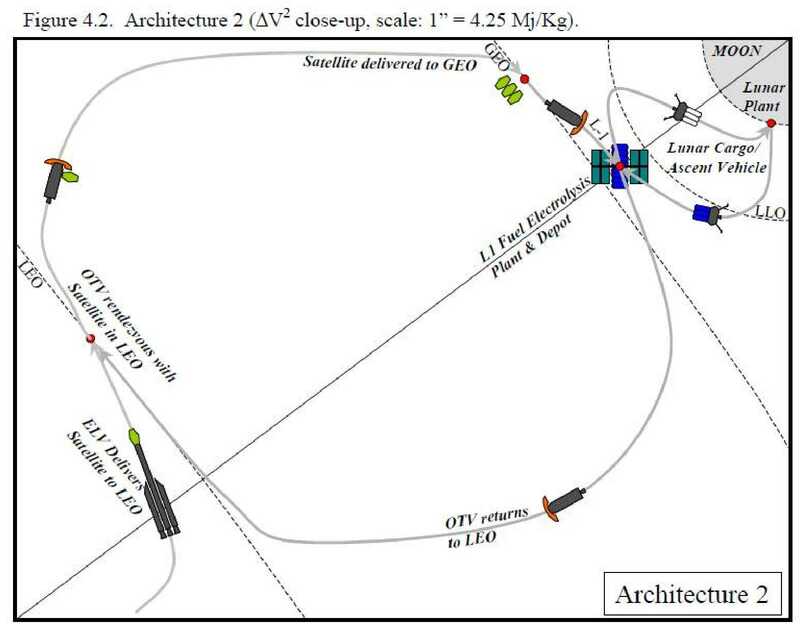 If my understanding were correct your analysis would need to add an extra 800-1200m/s for each OTV GEO to LEO trip. Which value do you think is correct? Brad Blair: Your numbers sound right, but remember I am a mining engineer and an economist by training. Some of our delta-V numbers were guesses. The team lacked an orbital mechanic, so we did the best we could. To the team the most important challenge was to make an end-to-end engineering and economic model that was interconnected – that was our real innovation. By making our assumptions transparent, we knew the model could be updated in the future. The impact of higher delta-Vs is an increase in propellant requirements to deliver the same level of service. This will increase the throughput of the ISRU plant and bump the transport vehicle flight rates somewhat upward as well. In short, it will increase the ops and capital costs somewhat. Q. What should I have asked you that I did not? Brad Blair: Lunar dust will be a major issue to overcome. Fortunately it may be susceptible to electrodynamic forces and could therefore be “steered” away from critical systems such as sensors, thermal management surfaces, solar panels and bearing seals. The same challenges will plague surface robotic missions by the way. Early demonstration of mitigation techniques will play a critical role in reducing risk. Emerging markets (beyond orbital debris as mentioned above) will be another very important consideration for business planning. But that is a separate conversation. Finally, one of the most important elements of the 2002 study in my opinion was the feasibility conditions that would attract private investment. We changed four primary variables to achieve feasibility. The first variable was ice concentration as discussed above. 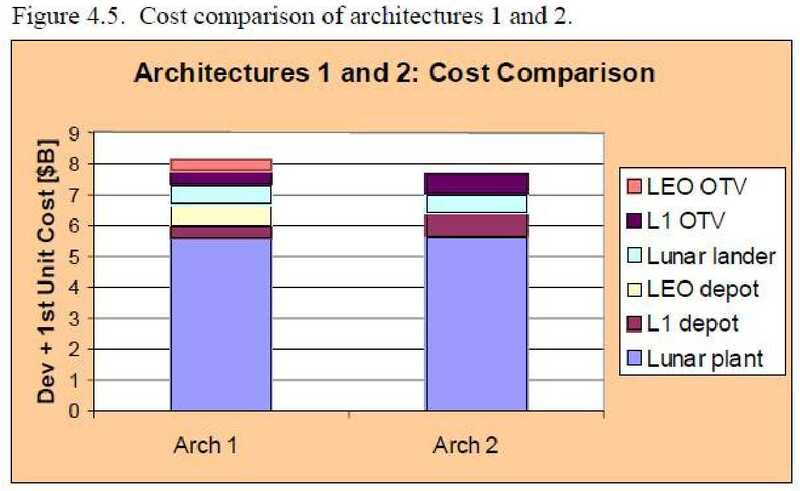 The second variable was development costs. We dialed those down to zero, assuming that a NASA program would develop ISRU for a human lunar mission and hand the technology to a private operator. This has already started under Constellation. The third assumption was that production costs would be 40% of what NAFCOM said the government would normally pay. An argument can be made that if paperwork and overhead costs can be reduced this may be possible, particularly for a private company. The final assumption was that the market size doubled. This could be achieved by engaging customers in “emerging markets”. Q: How has your background prepared for this lunar analysis? Brad Blair: In mid-2003 I was working with a small team of grad students under the leadership of Mike Duke, the director of the CSM Center for Commercial Applications of Combustion in Space or CCACS. Were working for NASA-RASC developing a human ISRU architecture with engineers at JSC, KSC and Glenn. In January of 2004 EV was announced and we were stunned, being the largest academic group actively studying in-situ resource utilization (ISRU) under NASA contract. Most of the team converted to join Lockheed-Martin's team for the CE&R. I left the group to join Raytheon's Senior Advisory Board for their CE&R architecture. We also gave copies of our models to t-Space. Four of the 11 CE&R contractors used ISRU as an element of their lunar architectures (see links below). Since that time CCACS has changed names to become the CSM Center for Space Resources (CSR) and is now run by Angel Abbud-Madrid. Mike Duke has retired. CSR remains actively involved in NASA and international space agency ISRU programs and enjoys an excellent reputation as an active CSM research arm. While I remain affiliated with the Center, I have gone primarily into consulting since that time. As a member of the CE&R advisory board to Raytheon I helped bring the ISRU element to their lunar architecture. I also participated in the analysis of related space commercialization opportunities, helping to call a meeting with other CE&R participants to investigate commercial spinoffs enabled by what would become the Constellation program. This meeting directly lead to the formation of the first space investment summit, a project that continues to this day. Finally, in 2005 I helped the Raytheon team pitch the Texas Governor's Economic Development Office on the merits of a Texas-lead commercial LEO propellant depot with the help of the NASA Innovative Partnership Program. In 2006-2007 I worked for DigitalSpace corporation on SBIRs related to simulating lunar mining and robotic systems using real-time open-source software, and for Bechtel Nevada as a consultant on lunar base simulation and design for NASA-SOMD. I then went underground for about 1 1/2 years, found a private investor, and began developing proprietary technology for the Centennial Challenges program for the power beaming, MoonRox and excavation contests. The first contest attempt was short lived when my partner Dr. Bernard Eastlund (who holds the patents on the HAARP array in Alaska) passed away. The second shot (MoonROx) ended up developing a lot of IP, but was put on hold for the third contest with the assumption that it would be renewed - so far this has not happened. For the third contest I partnered with a Canadian R&D outfit who raised $250k and built a very sophisticated system for the Lunar Excavation Centennial Challenge. We placed in the contest but did not win. In 2009 I spent a year working with Penguin Automated Systems of Sudbury, Canada writing a report on ISRU for the CSA. My most recent work has been working with a handful of entrepreneurial startup companies and with a law firm that is creating workable solutions for space commerce, governance and property rights. Mining on the Moon is an exciting topic. has encouraged me to consider the near-term economics of lunar mining. Brad Blair has been a very helpful resource to me as I learn more about this potentially lucrative future space market. This is Part 1 of a two-part interview with Brad Blair as we discuss his 2002 paper entitled “Space Resource Economic Analysis Toolkit: The Case for Commercial Lunar Ice Mining.” Get your copy here. In the interview below, Brad provides an overview of several lunar ice-mining architectures his team considered with a goal to make commercial lunar mining possible and profitable. I ask Blair how the recent success of SpaceX and the increased quantities of lunar data and water have effected this analysis. In preparing this paper, Brad was very deliberate to provide not only his conclusions but also his assumptions. Readers of his paper will find the added detail quite helpful in developing their own models. Brad welcomes the feedback. The images used in this blog post are from the paper referenced above and used with permission from Brad Blair. Who is Brad Blair? Dedicated to opening the space frontier for human settlement and commerce, Brad has spent twenty years developing technical and economic systems to enable planetary surface in-situ resource utilization (ISRU). As a professional space consultant to NASA, Bechtel Nevada, Raytheon and the Canadian Space Agency, he has authored or co-authored a number of technical reports and over 50 conference papers on topics related to accessing the wealth of space for the benefit of mankind. He holds a Bachelor's degree in Engineering Geology, and Master's degrees in Mining Engineering and Mineral Economics from the Colorado School of Mines. Q. You describe your analysis as a combined engineering and financial model. You say in your paper, “an architecture optimized from an engineering point of view is not necessarily the most interesting for private investors.” What do you mean by this? Brad Blair: Investors typically care a lot more about return on invested capital than about optimized hardware or new technology. An example can be found in the story of the development for NASA of a brand name space pen. A typical ballpoint pen is gravity fed, with the ink reservoir replenished due to storing it in the proper orientation. A special space pen was developed for NASA using a small pressurized bladder to ensure fluid flow in the proper direction under microgravity conditions. While engineers were able to successfully implement an elegant technical solution, the process required substantial amount of R&D with its associated cost. Production models are also costly due to the complexity of the system, and indeed can be found in many NASA Center gift stores. The Russian solution was to use a pencil. Commercial space enterprises will use pencils or other commercial off the shelf (COTS) hardware wherever possible. 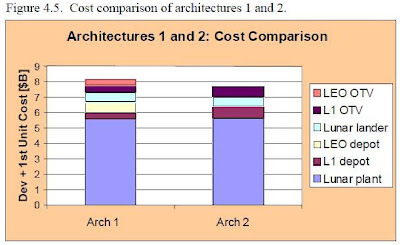 Cost optimization is very different than technical or engineering optimization. Q. 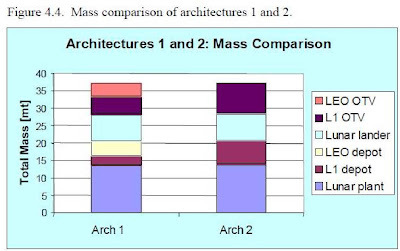 Your analysis described two main architectures. Describe these for us and how you came to favor these two options for profitably mining lunar ice. Brad Blair: First I must point out that under the baseline starting conditions neither of the architectures showed profitability. Our process was to start with realistic assumptions and "worst case" costs (i.e., what a government space program would pay to develop all new hardware) and then relax the assumptions until an ROI was achieved that would attract private capital. The second architecture was slightly better than the first when these more relaxed or liberal conditions were modeled. 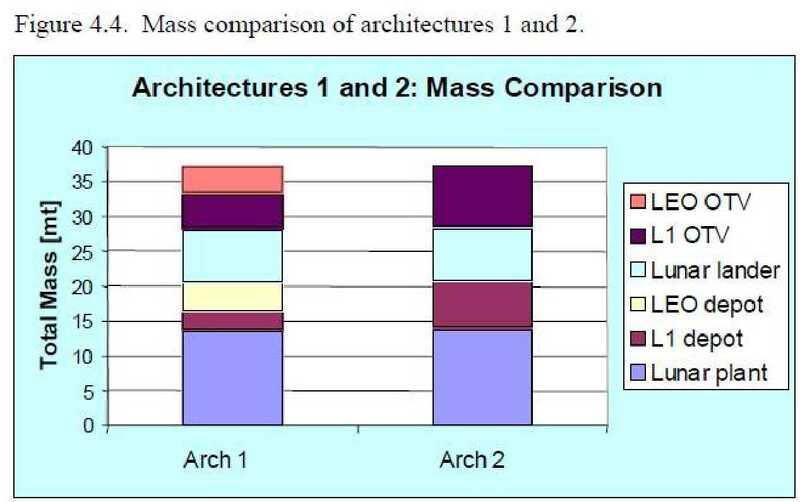 Figures 4.1 and 4.2 of the report show pictures of the architectural elements and configurations. an OTV for carrying propellant and cargo. Architecture 2 had only one (at L1). According to our estimated delta-Vs, there was a slight advantage to operating a single propellant depot at L1 due to its ability to fall into various inclinations without a major penalty, thus increasing the number of customers that could be reached by a small set of vehicles and systems elements. Q. The goal of your architectures is to be able to offer satellite transport from LEO to GEO via space tug for $25K/kg (with a preferred target price of $20K/kg). You also mention the counter intuitive fact that reduced launch costs actually hurt your business case. With Falcon 9’s price already at about $22K/kg to GEO (4540kg to GTO, $50M price, assume half GTO mass is kick-stage), how does such low launch prices affect your business case for lunar-based propellant? Brad Blair: There would of course be a direct downward impact on revenue (it would be cut roughly in half according to your numbers above) given that the technical, cost and market assumptions of the 2002 study remain steady. 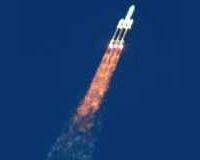 However, a premium could be assessed for transferring payloads beyond the reach of the current fleet of expendable rockets. 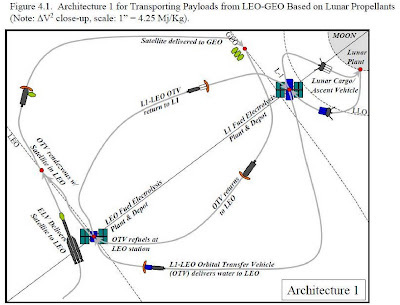 For example, until someone builds another heavy lift vehicle there is only one way to move a 10 ton payload to GEO with today’s technology, and that would be by refueling an upper stage in LEO or by docking with an OTV that had a full tank (perhaps launched separately without a payload attached). In that case, the price backstop would be how much it costs to conduct the ops from Earth with all expendable systems – very costly if an HLLV is chosen and the development costs are amortized over the first few flights. The gist is that the revenue model for the 2002 study is fairly simplistic, and that updating it could involve both upward and downward adjustments in revenue streams. In either case the point is that the revenue model was based on estimating the cost of a terrestrial competitor for a specific mission profile and discounting that value a bit. Thus price can be modeled in a straightforward fashion using the same approach for future models. Q. You argue in the Annual Market Demand section of your paper, “a thorough study should estimate the potential for new markets emerging from the availability of the space resource.” Talk about emerging markets for lunar resources and how influential emerging markets would play if you were to consider an update to your analysis. Brad Blair: Emerging markets will make or break the business case. They are where the real action is at. It is an unreasonable expectation that current launch providers will simply give up their existing market share for LEO to GEO transfer and join the bandwagon. It will be an uphill battle and not be easy to win. Having said that, if sufficient additional customer demand can be stimulated in order to actually increase throughput of space vehicles in existing factories and benefit not only the propellant provider but launch vehicle manufacturers as well, a win-win scenario could emerge that will benefit all involved. For example, a radical shift in on-orbit operations cost would enable orbital debris cleanup. I personally consider debris management the killer app or airmail of the 21st Century. As evidenced by the recent collision of Cosmos 2251 with Iridium 33, there is a growing danger of an exponentiating number of objects larger than 10cm. We are closer than many want to acknowledge to a chain reaction that could wipe out needed orbits for centuries or even millennia. With current technology it would become impossible for humans to penetrate the debris clouds that would result from a runaway reaction. Something needs to be done now, yet the excuse "it is just too costly" frequently emerges. Reusability and propellants could change that dynamic. In my opinion, an international escrow account should be created and funded by some combination of the polluters and beneficiaries of cleanup. This would then be used to create a bounty on certain types of orbital debris. Then the marketplace itself would determine the best solutions to cleanup. If no takers emerge the first year, increase the bounty. If too many show up, decrease it. Once the coffers are empty wait until next year and they fill up again. It would be a self-regulating system that would begin to put a dent into one of the biggest "elephants in the room." Forget about the dangers of radiation - getting hit with a piece of gravel or a baseball going 10km/s is instant "game over" for an astronaut or spacecraft. Q. You mention public/private partnerships in your paper. How dependent will lunar pioneers be on such financing that blends Government and investor money? Brad Blair: Public private partnerships can be used to reduce various types of risk, thereby accelerating a commercial development timeline. For example, government investment in technology development could reduce operations risk and increase mission safety. Donation of time at costly lab facilities (e.g. large thermal vacuum chambers) could help space qualify commercial systems, reducing technical risk. Government-backed debt (e.g. bonds) could help reduce financing risk. Government anchor tenancy for products or services could reduce market risk. It is not as much an issue of dependency so much as the government having an ability to prime the pump and accelerate the schedule. The trade off here is that by investing in certain ways the government can steer the outcome toward a beneficial public purpose. So there is a payoff to the taxpayer as well. For example, a private lunar mining outpost might make an excellent base camp for NASA human lunar exploration missions. Another example would be to incentivize data collection for potentially hazardous asteroids in partnership with a mineral exploration venture. In the end it doesn't matter whether the asteroid is mined into a new orbit or abruptly blasted out of the path of a dangerous keyhole. By combining effort, costs could be reduced on both the public and private side of the equation. A recommended criteria for entering a partnership is that both sides should benefit. Q. Your analysis assumes no human miners involved on the lunar surface – all robotic. Describe how you came to this conclusion and if you still hold to this “human-free” approach to lunar mining. Brad Blair: It was a simplifying assumption at first. It would certainly have a downward pressure on cost if it works. The reason I still believe it is possible is that I spent much of 2008 working with Dr. Greg Baiden of Sudbury, Canada writing an ISRU report for the Canadian Space Agency. While the report is still embargoed, it does conclude that robotic preparation of an underground human habitat does appear feasible. This is based on Greg's experience as VP of research and development for INCO in the early 1990's, where he demonstrated that several pieces of underground mining equipment in two different mines could be run simultaneously from one operator cabin on the surface. The latency in the signal to and from the underground equipment approached 1.7 seconds. Estimates for lunar operations are in the 2.5 second ballpark. Based on that experience communication lag time may not be a major issue. You can listen here to a 2 hour interview with Greg at the Space Show. The second hurdle will be maintenance and repair (which can and should be implemented for satellites as soon as possible by the way). It turns out that one of the reasons that terrestrial mining equipment breaks down so often is because the cost of repair is minimal. It should be possible to design lunar mining equipment to operate in a much more robust fashion and demonstrate the ruggedness in thermal vacuum with simulated lunar soils. Another important step would be to instrument a lunar surface exploration rover with wear and abrasion sensors in order to implement and get feedback on solutions before the mining equipment arrives. Estimates for the 2002 study were that 10% of equipment mass would need to be replaced per year. We even included in the model a 1 ton repair robot with the sole task of maintenance. ﻿﻿In late Oct-2010, I attended The Space Studies Institute’s Space Manufacturing Conference 14. Session Two was on Extraterrestrial Prospecting. Here is the video of the presentations. When thinking about mass and power budgets, maybe these are the right scientific instruments, maybe not. But this question got me thinking about SpaceDev’s never-launched NEAP Prospector mission. How have the economics of the mission changed over the last 14 years? Launch: Secondary Payload on an Atlas V.
Instruments: alpha proton X-ray spectrometer to determine the elemental composition of the asteroid surface, leaving three canisters available to carry customer experiments or nano-rovers. Another source described the instruments as: a multi-band camera for navigation and asteroid imaging, a neutron spectrometer to search for water vapor, and an x-ray proton spectrometer to map the elemental abundance of the surface. Benson intended to land a probe on the asteroid and claim 1982 DB Nereus as a SpaceDev asset. I am not sure if he ever intended SpaceDev to mine Nereus. I personally feel he was more interested in pushing the issue of space property rights. SpaceDev announced Nereus was worth approximately $1 Trillion. Benson intended to sell the mission data on a subscription basis to scientists on earth and sell surplus instrumentation space on the NEAP spacecraft to a few lucky scientists. Could a superior NEAP mission be put together today…a NEAP Prospector 2.0? If so what would it look like and what has changed since 1997? Falcon 1e could dual manifest a NEAP 2.0 mission for about $5M. I am not sure what the cost is to launch 200kg as a secondary payload on an Atlas V, but even if it were free or comparably priced to a Falcon 1e, the timing is key for such a mission to work (NEO’s won’t wait as they pass by). So being able to launch on a vehicle (like the Falcon 1e) where you have much more say in the launch window would enhance the chance of mission success and reduce the need to spend extended time in LEO (which is how you would avoid this risk if launching on an Atlas V as a secondary payload). NASA’s ILDD announcement to purchase lunar data from GLXP teams provides an intriguing precedent. Would NASA be interested in a similar arrangement on such an Asteroid mission. Since 1997, smallsats and CubeSats have gained traction, acceptance, and increased capability. NBC paid $600M for the US broadcast rights to the 2010 Winter Olympics with billions more committed for the coming years. I know that a private asteroid landing is not the Olympics. But there may be serious money available for the media/advertising rights for such a commercial mission. Here is one fun advertising idea I cannot take credit for (but I can’t remember who I should give credit to). Would Nike pay for an image from the surface of an asteroid of a footprint (similar to the Apollo footprint) with a Nike Swish embedded in it? I could easily see that image on the front page of the USA Today announcing commercial exploration has arrived. If Lebron is worth $90M to Nike, surely such an image is worth a good chunk of $40M?! SpaceDev (Now Sierra Nevada) is not the startup it was in 1997. They can deliver more capable products than they could fourteen years ago. After a series of acquisitions and a ridiculously successful track record, I would love to see SpaceDev/Sierra Nevada involved in any NEAP 2.0 mission, even if only as a subcontractor…for poetic and Benson-honoring reasons if for nothing else. For you philanthrocapitalists out there, a NEAP 2.0 mission would offer some significant bragging rights among your billionaire buddies. Even if you didn’t pay for all of the mission's $40M price tag (to keep with the 1997 estimate for mission cost), $5-10M invested and a few key press releases to get the momentum going could make such a mission viable. I still like the “land-on-it-and-claim-it" strategy for media reasons alone. And it would definitely force the issue of space property rights. I still like the idea of opening up the payload manifest to include data gathering equipment provided by other Space Agencies or universities. This is a cheap way to get others to pay for equipment that you would otherwise have to develop yourself. The sticky issue, however, would be the data rights to the information generated by a particular agency or university's onboard equipment. Who owns that data? Can you still sell that data? Would they be allowed to write their paper announcing discoveries found as a result of their on-board instrument? Again subscription issues. A commercial asteroid mission could be performed today. No new technology is needed. We have the smallsat buses. Many (all?) of these instruments have been used for missions in the past (well, maybe not ground penetrating radar). Cheap launch opportunities are available. By the time you read this, even more NEOs may have been found. Philanthrocapitalists have already invested in suborbital and GLXP, why not NEAP 2.0? What do you think? How is today’s environment either more or less friendly to a NEAP Prospector 2.0 mission? Fourteen years goes by quickly. Let’s not wait another fourteen.